Want to make your project as sustainable as possible? We can help you. Alex, our MD is a qualified retrofit co-ordinator with The Retrofit Academy and can advise on the best way t o carry out energy efficient domestic retrofit projects. This includes appropriate insulation and glazing, ventilation and designing in energy efficiency. Alex can also advise on thermal bridging and airtightness and has worked on Passivhaus projects. 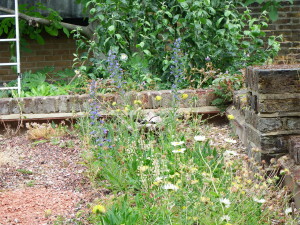 roof or wall into a wider Sustainable Drainage (SUDs) scheme, designing in rain gardens and wetlands. We can also call on expertise in these areas from across the industry if you are looking to build a larger scale green roof, living wall or SUDs scheme. As well as green roofs we can offer input on adding features to encourage bats and birds, creating suitable habitats and avoiding habitat destruction in your build. Finally we can advise on incorporation of reclaimed and recycled materials into your build. 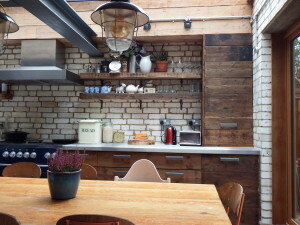 A recent projects used glazed bricks reclaimed from a lift shaft in Hammersmith and floorboards from old houses to create a very cool looking kitchen with a low impact on the environment. We also reused all the bricks in the demolition stage to build new walls and the client built a barbecue with the remainder. We can also offer project management and construction services for your project click here for details.